This preamp which have very dynamic range, and it's seem to have become a model to following things. Sometimes, Haz-copy models made for other basses. By the way, Fodera basses used this preamps in middle '90s. 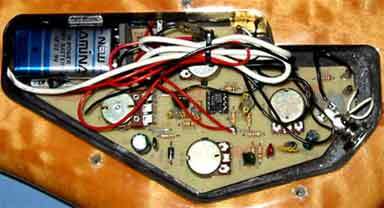 Many pre-Kramer Spectors used Haz Lab preamps. A battery cable pin made by alumite is easy to make exchange be hardening very much. Four dumpy emerald-colored insulation resin parts are outstanding. 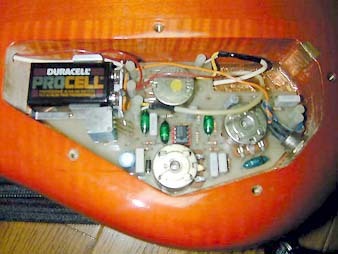 (I don't know a lot about electric knowledge...) The board marked by a red marker on volume pot is seel well. And, It's a characteristic that only the left balancer pot is square. A cylindrical parts (an aluminum electrolysis condenser) of the lower left, colored by light blue. Conductive shielding paint is not painted many cavities. Only copper foil that it put on a base. But, it's terrible that there are not most of the noises. 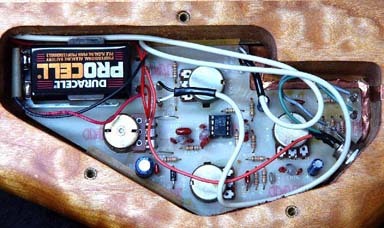 First Photo : A mysterious US-made circuit. It like pre-Kramer things, but, It's different a little. It may be one of circuit of a transition period. 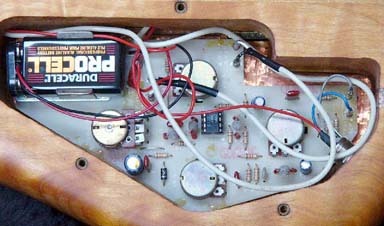 Second to Fifth Photos : These circuits are standard type in Kramer era. They have circular volume pot and balancer ones. 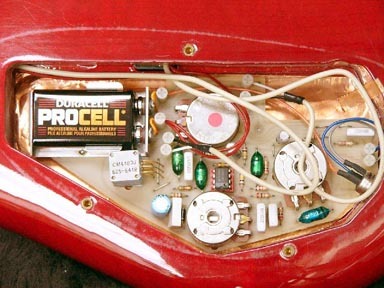 There are products made in US and made in Japan that used each country basses. These circuits resembles. 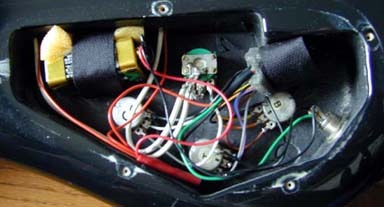 A method to distinguish these is Velcro tape of a battery box. A thing having Velcro tape was made in Japan. First and second pics circuits were made in US. I don't understand that a sound is different. But, It does not have a difference that both owners are satisfied. A kind of HAZ Lab in SSD era. It's a little unusual type. 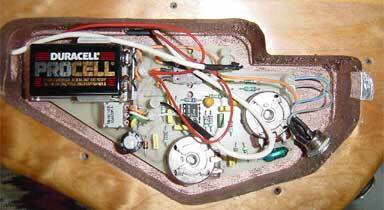 "That is a kind of early model EMG BTS or BTC?" It was convinced so among fans. 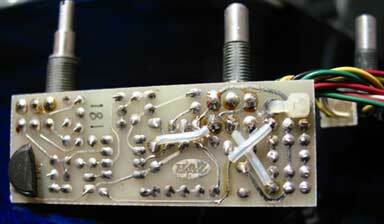 But, when a preamp separated from body, I found printed "HAZ" on back of a board. 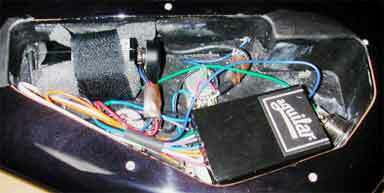 18V battery box separated from main cavity. Conductive shielding paint in cavity started SSD era. There is an example doing both copper paint but almost painted with black color. 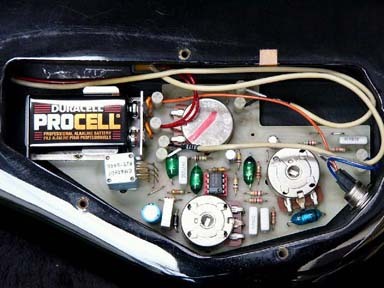 The black colored conductive shielding were used for Czech models after that. A kind of curcuit SSD era. 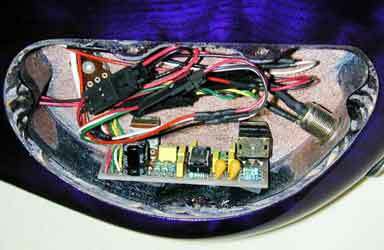 If this volume pots becomes square, it will seems to become following WoodStock preamp. 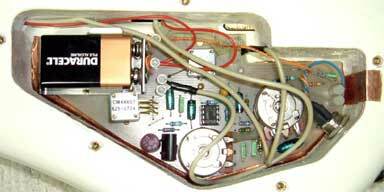 An original preamp made in US. Probably, I think that it's adopted from about 1998. It resembles SSD one or HAZ one. The details are unclear, but, it may be the HAZ Lab of a present version. 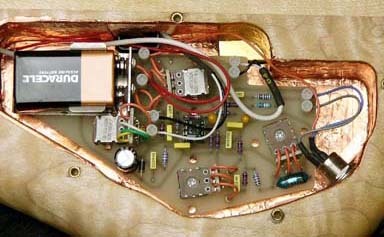 Shield copper foil are crowded close together in cavity. That's luxurious! 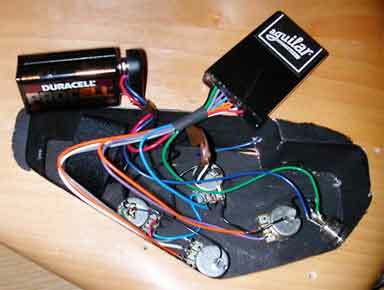 In addition, there are EMG BTS (several kinds), Aguilar OBP-1 (black box type) and TonePump (black box type) etc. Especially, BTS black box type is incredibly small!! It's technical progress? oh,,,, but, good sound, I recognize it.